Posted by Rinchen in IBA news, Sakyapa Writings. 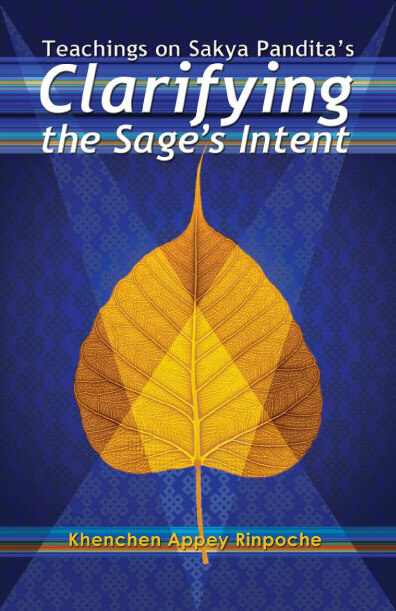 We have published a new edition of Teachings on Sakya Pandita’s Clarifying the Sage’s Intent. The text is drawn from teachings Khenchen Appey Rinpoche gave on Sakya Pandita’s classic, Clarifying the Sage’s Intent. This book is published here in Nepal by Vajra Publications but it will be available worldwide through Amazon.com and other distributors. Clarifying the Sage’s Intent describes the stages of the bodhisattva path from the very beginning right up to full and perfect enlightenment, following the teaching tradition of the great early Kadampas. The teachings are based on two verses from Maitreya’s Mahayanasutralamkara (Ornament of the Sutras), which cover the entire Mahayana teachings of the Buddha. Mahayanasutralamkara expounds ten stages of practice. The first is spiritual propensity; the second is convinced adherence to religion; the third is generating the enlightenment thought; the fourth is accomplishing the perfections of generosity and the remaining perfections; the fifth is maturing sentient beings; the sixth is entering upon the stainless paths; the seventh is thoroughly purifying the realms, the eighth is nonabiding nirvana; the ninth is the highest awakening and the tenth is demonstration. Posted by Rinchen in Sakyapa Writings. What is the cause of renouncing this life? It is the awareness that the cycle of existence is devoid of essence. What is the contributing condition for such renunciation? Seeing the faults of the cycle of existence. What is the criterion of renunciation? Mentally turning away from the Eight Mundane Concerns. What is the sign of renunciation? Not being affected by the Eight Mundane Concerns even though one encounters them. What is the criterion for attaining Enlightenment in one life? Liberating one’s body from aging and death and accomplishing the nature of the Four Bodies of a Buddha. What is unspecified action? Action that is unable to produce either good or bad results. What is dedication of merit? Something that transforms the causal roots of virtue into whatever result one desires. What is prayer? The yearning for bountiful results [of spiritual practice]. What is the meaning of auspicious verses? Special words that produce good results by the blessing of truth. In realizing the nature of the mind, is there a complete grasp of the meaning of the Three Collections of Teachings and the Four Classes of Tantras? There are two realizations: Realizing the emptiness of the mind, and realizing the union of apparent reality and the emptiness of mind. In realizing the emptiness of the mind, one does not fully grasp the meaning of the Three Collections of Teachings and the Four Classes of Tantras. With such realization one may fully comprehend the Cessation of a Listener (Shravaka), but since that cessation falls to the extreme of emptiness alone, one would not grasp the meaning of the Mahayana teachings. This is stated in all the Mahayana Sutras and Tantras. In realization of the union [of apparent reality and emptiness], there is no blemish of even the most subtle faults. It therefore holds the basis of morality, and the Collection of Vinaya is complete. Since the Heroic Samadhi and all other states of concentration arise [from such realization], the collection of Sutras is complete. Since it cognizes all knowable things, from form to the Omniscient Mind, the collection of Abhidharma is complete. And due to its comprehension of the special outer and inner dependently-related events, the Four Classes of Tantra are complete. Are the Three Jewels complete in one’s own mind? In the mere emptiness of the mind and the understanding of that emptiness, the Three Jewels are not complete. In the union of the cognition and emptiness of the mind, the seeds of the Three Jewels are complete. If one properly realizes the meaning of that union, the Three Jewels are manifestly complete. Is the Supreme Accomplishment (Siddhi) attained due to the Guru or the Meditation Deity? It does not occur from either one separately. Rather, it occurs due to the Guru, the meditational Deity, the Buddhas of the three times, one’s own mind, and from the realization of the indivisibility of all of Samsara and Nirvana. What makes a person one’s true Guru? The person from whom one correctly receives the four empowerments in accordance with the Tantras in one’s true Guru. A Guru from whom one has not received such empowerment – how ever good a person he might be – is one’s Guru in name only, For example, the person from whom one receives monastic ordination is one’s true abbot, but if one has not been ordained by someone, he is not one’s true abbot. And even if he is called “Abbot”, he is such in name only. Thus: “without bestowing empowerment, there is no Guru. Without monastic ordination, there is no abbot. Without precepts, there is no continuum of virtue. Without going for refuge, one is not a spiritual person.” That is the meaning of the above verse. Is it possible for there to be hearing, reflection and meditation concerning one utterance of the Buddha? In reliance upon one utterance of the Buddha, one may practice hearing, reflection and meditation. The nature of such an utterance is that it is an enlightened activity of a Tathagata. Among all the teachings of the Buddha, which are profound? With respect to the mentalities of individual disciples, all of the teachings are profound. On the other hand, only the Tantric teachings are profound for all disciples in common. Is a person who realizes the emptiness of the mind a Buddha? One who has realized emptiness alone is not a Buddha. If one comprehends all knowable things, one is fully enlightened. Furthermore, there are two modes of comprehension, the comprehension that there is no realization of an ultimately (i.e. inherently) existent phenomenon; and the comprehension of all distinct, conventionally existent phenomena. Do you claim to be a realized person? Since I have not ultimately realized any phenomenon, I do not claim to be a realized person. But since I know the Five Fields of Knowledge concerning conventional truth, I claim to be a Pandit. Among your pupils are there some who ascertain the nature of the mind? I understand that among my pupils there is no one with ultimate realization of the mind, but there are many who are learned in conventionally existent phenomena. The mind being without [an inherent] nature, what is there in the ascertainment of the mind? At what point does one have the certainty of attaining Enlightenment? Some people realize the emptiness of the mind alone, but have not perfected the qualities of the Method aspect of the training. Some have such qualities, but do not realize the emptiness of the mind. Some have both, but they are not able to guide their practice of the Method with their knowledge. Some have the other qualities, but since they lack the lineage of blessing, they are unable to generate the Clear Appearance. Thus, I fear that Buddhahood is far from them. Since I have a number of these attributes, I hope to attain Enlightenment, but not by the swift means. Who is your Root Guru? My Root Guru is the Great Sakyapa Drakpa Gyaltsen, the Vajradhara, who is the nature of the body, speech and mind of all the Tathagatas of the three times. For what reason is he your Root Guru? He has granted me the four empowerments of the vase, and so on; he has shown me the four paths of the Stage of Generation, and so on; he has set forth the dependent relationships of the Four Bodies, including the Emanation Body, etc. ; in short, since he practices in accordance with the Buddha’s teachings in the Sutras and Tantras, he performs the deeds of a perfectly enlightened being; and thus I regard him as my Root Guru. On the other hand, one who does not grant empowerment according to the Buddha’s teachings, does not reveal the Path and does not set forth dependent relationships, but does ascertain the mind, is limited in his teachings to those leading to the Cessation of a Listener – regardless of whatever merit he accumulates. Such a kind of person is not fit to be regarded as the Root Guru of a Mahayana practitioner, for that path is not a Mahayana path. Thus from the treatise called Synthesis (sDud pa): “With Wisdom alone, without the Method, one falls to the state of a Listener.” Thus, those who give little emphasis to the Method and great emphasis to Wisdom slip down to the Nirvana of the Listener. Which path to Enlightenment is shorter: that of a learned pandit, or that of a “kusulu”? In general, the acts of a “kusulu” are impure. “Kusali” means “a virtuous person”. There are kusalis who do not rely on the Buddha’s path, and there are also pandits who do not rely on that path. Neither of them become Buddhas. There are both pandits and kusalis who are Buddhists. Among them there are both pandits and kusalis following the Vehicle of the Perfections who attain Buddhahood, and it takes them three countless eons to do so – a long time. There are also tantric pandits and kusalis who establish internally certain dependent relationships and thereby swiftly attain Enlightenment. Now it is said that the task of a pandit is to become learned in the outer and inner field of knowledge. And it is said that a kusali supremely devotes himself to inner practice, after discarding all external affairs. To attain perfect Enlightenment, one first becomes knowledgeable regarding all knowable objects and cuts through false assumption by means of hearing and reflection. Then by taking Samadhi as one’s essential practice, one cuts through false assumptions by means of meditation and thus achieves the Dharma of Insight. In this way one gradually attains Enlightenment. Therefore, it is necessary to be both a pandit and a kusali. In terms of those approaches taken separately the pandit is closer to Buddhahood. Now one might object to that, citing the Sutra, Mound of Jewels (dKon mchog brtsegs pal): “If one meditates for one moment, the merit from this is greater than that of listening and explaining to others for ten eons.” I think there is no contradiction here. The meaning of that citation is that meditation [has such benefits] if one already knows the object of meditation; but without such knowledge, how could there ever be such benefits? The Vinaya scriptures also state that one should not meditate in a hermitage without having understood the Collections of Teachings. The Treasury of Phenomenology (mNgon pa mdsod) also states: “Endowed with proper hearing and reflection, Devote yourself to meditation.” Arya-Deva also states: “Without relying upon conventional reality, One will not realize ultimate reality. Without realizing ultimate reality one will not attain Liberation.” Thus, in all the Sutras it is frequently said that by hearing certain points of Dharma, one is liberated from certain obstacles. There fore, if hearing and reflection liberate one, one is advised to meditate afterwards. It is wonderful that you dwell as a contemplative, and I think it would be good if you continue in your efforts on the path of the Tantric method. I realize that there is no realization of the answers to the question of this realized person (i.e. yourself), I understand that there is no understanding, and I know that there is nothing to be known. This concludes my responses to the questions of the contemplative Nyimo Gomchen. All such opportunities as this — to hear, to learn, and to integrate within one’s own consciousness the teachings of enlightenment taught by Shakyamuni Buddha — are extremely rare. Very few beings have such an opportunity. Many live their lives cut off from the Dharma. They have no access to the path of liberation. As a result, they suffer and, through delusion, create more suffering for themselves and for other beings. This suffering goes on and on; it is endless and manifold in its manifestations. The law of karma that turns the great wheel of interdependent origination, the inexorable cycle of deluded mental processes, will carry us away from this unique opportunity to take hold of, and be rescued by, the saving Dharma. If we remain under the control of this round of delusion, the evolution of the twelve nidanas, or links of interdependent origination will cause us helplessly to roam about from one state of existence to another. If we do not break free from the wheel of delusion through wisdom and right understanding of the Way, we are sure to continue to experience pain. If we do not make this break, the three kinds of pain — of impermanence, of pain itself (in the lower realms), and of conditioned existence — will continue to plague us. This is the future that awaits each one of us who fails to pause, reflect, and make a sincere effort to realize these Dharma truths. First, He taught the system of the Hinayana Buddhism with its concept of individual salvation. For others of greater spiritual capacity, He taught the noble doctrines of the Great Way of Mahayana Buddhism with its concept of universal salvation. In the Mahayana system, one takes the Bodhisattva’s vow to liberate all living beings as well as oneself. It has as its result the attainment of the three kayas, or aspects of perfect enlightenment. However, this path of Mahayana practice requires that three incalculable aeons be spent in perfecting the qualities of Bodhisattvahood. If one preserves one’s vows and meditates diligently, one will attain perfect enlightenment – — Buddhahood — in this very lifetime. But this system does require that one be endowed with superior mental faculties: one must be extremely intelligent and diligent. Yet one can be assured of enlightenment either in the bardo state or in the next life-time if one is only of mediocre abilities, understanding, and diligence. Even if one has very little spiritual development and is unable to practice at all, one is still assured of the attainment of Buddhahood within not more than sixteen lifetimes. Yet there is the danger of taking hold of Dharma wrongly. If this danger is not avoided and one’s approach to Dharma is faulty, ‘Dharma’ becomes a cause of harm instead of benefit. This is not the intent of the Enlightened Ones nor of those masters who have entrusted it to us. Recognise and avoid this danger: it is called ‘narrow-mindedness’. It manifests in sangha circles in the form of sectarianism: an attitude of partiality, a tendency to form deluded attachments to ones own order and to reject other schools of Buddhism as inferior. I have seen this narrow-minded spirit detract from Buddhism in my own land of Tibet and, during the past 20 years of my stay in America, I have also seen it grow among the many Dharma centers founded here by Tibetan teachers and their disciples. It is always with sorrow that I observe sectarianism take root among Dharma centers. It is my karma, as a representative of Buddhism and as a Tibetan, to have the opportunity and responsibility to speak out, when asked, against this ‘inner foe’. It was common in Tibet for the least spiritually developed adherents of each of the four great orders to nurture this spirit of sectarianism. Often monks and lay disciples of one order would refuse to attend the services of other orders. Monks would refuse to study or read the literature of others simply because they were the writings of masters who belonged to another lineage – — no matter how good the literature might be. The great Nyingma order – – – the Order of the Ancient Ones – – -has its own special pride. Some of its followers feel that, as members of the earliest school, they have profound doctrines unknown to the later schools of Tibetan Buddhism. They maintain that somehow their doctrine of ‘Great Perfection, is superior to the ‘Mahamudra’ perception of ultimate reality. They make this claim even though, by logic and the teachings of the Buddha Himself, we know it is not possible that there could be any difference in the realization of ultimate reality. They also claim that theirs is a superior path endowed with secret teachings and levels of Dharma unknown to the other schools. The Gelugpa school, founded by the great Tsongkhapa, has its proud adherents, too. They think they are sole guardians of the teachings that were transmitted into Tibet by the great pundit Atisha, even though these are available and commonly practiced in the other orders. They have pride in proclaiming a superiority in moral conduct. They feel their observance of monastic discipline and their custom of devoting many years to study before finally turning to the practice of meditation constitute a superior approach to Vajrayana practice. They consider themselves to be superior both in deportment and in learning. Certain followers of the Sakya order also have their conceit about learning. They believe that only their school understands and preserves the profound teachings that were introduced into Tibet from Buddhist India. It is common for these Sakya scholars to look down on the practitioners of other orders, thinking that other Tibetan Buddhists are ignorant practitioners whose practice is not supported by right understanding of the Dharma’s true meaning. Some Kagyu adherents have their own special pride. They claim that their lineage of masters is so superior that they themselves should be considered superior — as heirs of Tilopa, Naropa, Marpa, Milarepa and Dagpo. These masters, it is true, were very great but it does not necessarily follow that one who claims to be an adherent of their tradition is also great. The greatness of these masters depends upon their realization. Blind allegiance to these masters cannot make Kagyu practitioners superior. All of these are attitudes commonly found among Tibetan Buddhist monks and lay people. They may be common attitudes but they are not Buddhist attitudes. 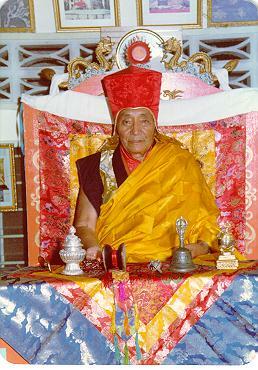 The great Kagyu master and Ris-med proponent, Kongtrul Rinpoche, stated that a wise person will have faith in the teachings of all orders, will love the Dharma found in each just as a mother cherishes all her children. A wise person’s mind is vast like the sky, with room for many teachings, many insights, many meditations. But the mind of an ignorant sectarian is limited, tight, and narrow like a vase that can only hold so much. It is difficult for such a mind to grow in Dharma because of its self-imposed limitations. The difference between the wise Buddhist and the sectarian Buddhist is like that between the vastness of space and the narrowness of a vase. These are the words of Kongtrul Rinpoche. First of all, one who despises another Buddhist school despises the Buddha. He impairs the transmission of the Dharma. The presence of the Dharma is jeopardized by such an attitude, and one becomes cut off from its transmission. This is so because one’s refuge vows are based upon reliance on the Enlightened One, His Teachings, and the Holy Community. If one rejects Dharma one breaks one’s refuge vow and thereby becomes cut off from the Dharma. By rejecting this Dharma that is the only door to happiness for beings and oneself, one accumulates inexhaustible sin. Therefore, the Buddha taught that one should also not despise the Dharma of non-Buddhists for it is their source of happiness and benefit. One should not despise or harbour contempt for the doctrines of the Hindus, Christians, or other non-Buddhist religions because this attitude of attachment to one’s own side while rejecting the possibility of differences is harmful to one’s own spiritual career. For these reasons, keep always in mind the great value of Dharma. Reject within yourself and in others any attitude that promotes the lessening of faith. We strive always for pure faith — faith that is intelligent, based upon the understanding that we must cherish these Three Jewels as the foundation of our own hopes for Buddhahood. Similarly, in the Vajrayana, all the tantras were expounded by Buddha in His tantric form — that of Vajradhara. These tantras and their instructions were transmitted from Vajradhara to various masters of Buddhist Tibet. Those same tantras and instructions have been transmitted purely, without interruption, down to the present time. They are common to all of the four orders. Though the lineage of masters may vary from order to order, there is no flaw in the purity and continuity of their transmission. One whose Dharma career is tainted by narrow-mindedness and attachment to one’s own interests while rejecting those of others will never overcome the many obstacles to the attainment of wisdom or insight. Sectarianism turns the pure Dharma into poison through it, one accumulates great sin. In this life one will be frustrated in one 5 own Dharma efforts. Upon death, one will fall into hell as swiftly d5 an arrow shot from a bow. These are the consequences of spending a lifetime in rejecting others’ spiritual efforts on such narrow-minded grounds.